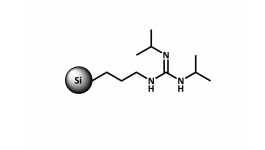 SiliaBond® Guanidine is a silica-supported diisopropylguanidine ligand. as in the alkylation of amines and phenols (Williamson ether synthesis) and the esterification of carboxylic acids using alkyl halides. It is also a new product that replaces SiliaBond TBD.